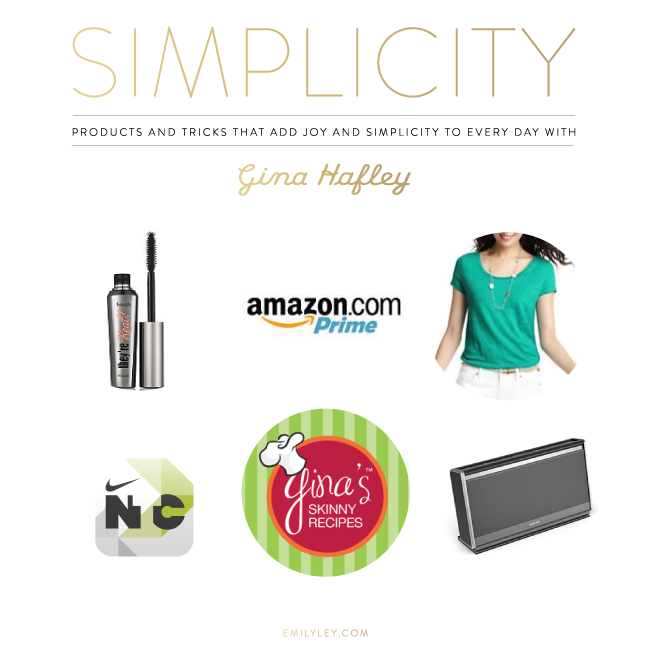 I’m so excited for our second SIMPLICITY feature featuring our very own Gina Hafley! Hello! I’m the email answering, goodies packing, design creating Shop Director here at Emily Ley. I’m also a soon-to-be thirty year old (eeek! ), who’s lived in three states over the last four years as we’ve followed my cute husband’s career. I enjoy traveling, a good cup of coffee or wine and a cute striped dress! I love when my toes are in the sand, but most often than not, they are on or near a football field. Image above is from North Photography captured at a friend’s wedding in Vermont. Benefit They’re Real! Mascara– Most days, I’m running out of the house to the EL Shop or to tackle an errand, with my hair in a pony-hail, athletic gear on my body and an au natural face. I very rarely wear “full” make-up these days. But, when I do…or when I’m quickly leaving the house, I almost always put on a little mascara. And, this, my friends is the best! I add a few strokes to my eyelashes and I’m ready to go! Quick, simple, and I look a little more alive! Amazon Prime– This one sounds a little silly, I admit. Especially since I don’t have a child (one day) or a demanding corporate job (been there, done that). But, I love Amazon Prime. There I said it. For $79 a year, Amazon Prime members receive free two-day shipping and $3.99 overnight shipping. And, Amazon sells anything and everything. Seriously. Those delicious nut crackers, Amazon has them for half the price at the grocery store. A pair of shoes for the husband, who HATES going to the mall. Yep, we’ve done that too. Books, coffee, closet organizers, face moisturizer, printer ink…the list goes on! It’s amazing what you can order with one little click, and how fast it arrives at your doorstep. * Emily: Can I just say how much I love this one. When Brady was first born and I desperately needed face wash, I used my Amazon Prime account to have it delivered to my door. I was so afraid to leave my house with a newborn and Bryan was traveling for work (yes, he travelled 3 days a week every week for the first year of B’s life). Insanity. Loft Sunwashed Tees– These are the best! Short Sleeve, long sleeve, stripe or solid. So many choices, and I think I have a few of each! These tees are SO soft and fit just perfectly. I wear them during the day with leggings or jean shorts, and at night, I throw on skinny jeans and a statement necklace for a dinner out. One simple tee. So many options. These make getting dressed and out the door a breeze! Nike Training App– Getting my day started usually requires two things: watching Good Morning America and a good workout! The endorphins, the stress release, whatever a workout does, it does my body and mind good! I like to switch up my workout, but I always come back to this nifty little Nike Training App on my iPhone. It’s like having a personal trainer, but totally free! Pick your goal, level and workout…and then ready to sweat! 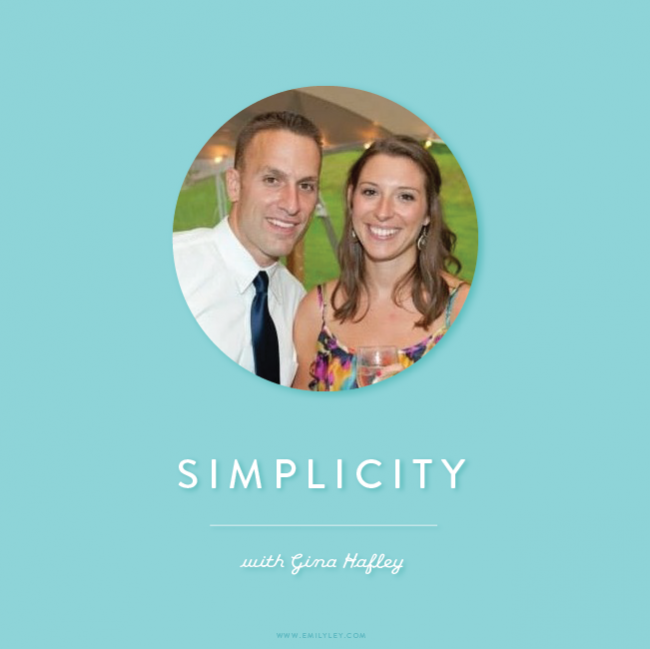 Gina’s Skinny Recipes– I love sitting down together as a family (or, just the two of us right now) and eating dinner at our dining room table. But to get to that, means I must cook—and though it’s something I enjoy, I very much need some guidance. Enter this site. (And no, it’s not me. :) ) The recipes are simple, require very few ingredients and are healthy. It doesn’t get better than that! And, everything I’ve made has been so yummy! A few of my favorites for an appetizer, entrée and pasta. Bose Mobile Speaker– This is actually one of my husband’s “toys”—but I think I use it more than him, so I’m adding it to my list! :) I find myself using this amazing wireless, Bluetooth connecting speaker all the time! It’s constantly on while I work at my computer. BUT, and maybe most useful, I tend to take it with me to make some of the dreaded household tasks a little more enjoyable. A little Luke Bryan goes a long way when cleaning, putting away laundry or weeding!